Home Soccer Roig: "Under my responsibility has been decided the return of Calleja"
Roig: "Under my responsibility has been decided the return of Calleja"
The president has revealed, as announced by AS, that the technician who was dismissed 49 days ago is again the coach of the Submarine, by his own decision. 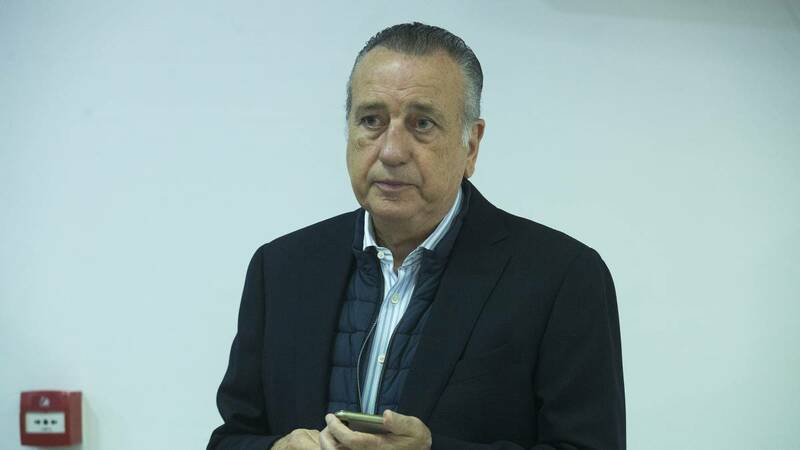 The president of Villarreal, Fernando Roig, appeared before the media after communicating this morning the decision to dispense with the technician Luis García Plaza. Luis García: "Thank the team of Luis García the effort to dedicate the day 15 to 21 for having tried. " Calleja:" The decision is to retake the former coach, Javier Calleja, we will all go to one to achieve the goal, sign up until the end of the season and Calleja totally agrees. I assume full responsibility for what is going to occur from now until the end of the season ". Decision: " The situation has not improved, I assume, as president, the decision to make a necessary change, we have 17 games left, for which I think we need a coach who has knowledge of the club, the staff, is involved and has the ability to take the situation to continue in First. or we have very difficult but we have to go together. Under my experience I want to assume and assume the decision I have made. It was a necessary change and under my responsibility the decision was made ". What remains: " We have 17 games left and of those 17 we are not going to make numbers. The decision that I have valued that has the knowledge of the staff, the club, involved and responsibility and that is capable of all the players we have. That we are able to redirect the situation and be able to be in First next year. Together, with the fans, the best we had in the Athletic match. I ask you to continue pressing. " How is Calleja told we were wrong? :" We have not been wrong. We saw that at that time it was best to change technicians. It was not a good situation, with 14 points in 15 games. " What do you ask the players ? :" I'll tell you something. Speak less and do more. Less politicians and more entrepreneurs. "Was your opinion taken into account then? : " It was my same opinion. It was not good work and I hope that this experience will serve us all. The players go by plane and if we do not improve we will all go by bus. "Market for signings: " We are not here to value the market. It is difficult to leave something after two days of closing. It has been tried but it has not been possible to obtain. "One of the most complicated moments ? : " When we went down it was a very hard situation, but we managed to get out. I hope I will not get to the same situation and solve it now. "How has Calleja taken it ? : " After having a very good season last year, I hope you learned the errors or inaccuracies of this season and that this second stage hit and the level of demand is high. " Calleja reaction ? : " Very positive. He is delighted Implicated, knows the template, the situation of the club, responsibility and a crazy desire to train and have spent six days outside the club but I hope that we all go well. Maybe this squeaks a bit but Villarreal and Fernando Roig distinguish themselves by doing the opposite of what many people think. " Can you return legally? :" Villarreal is legal and does all things legally. We are within the law and can retrain. If there is someone who thinks not, go to the court and report it. "New contract? :" It's not the issue. It can be done however, the important thing is that both parties agree. It is not important for this situation. "Duration of the contract? :" From the 21st day to the 38th, 17 days including the Europa League in which I hope we have more than two games left. "Have you talked to the Template? : "I have not spoken to the template. My job is not to talk to the players. What do you say to the fans ? : "The president says that the best solution is the one that has been taken, under his own responsibility, to be next to the team and press and tighten, there are seven or eight teams that want to Same as us, at 43 we'll take out the bottle of champagne. " Have you talked to Calleja about changing things to improve the previous points average? : "You have to change, but everyone, each one on your plot, to say what I can change, everyone should look inside and think about what they can do. All you have to do is measure yourself in that way, change and do things as they should be done. " Change and again Calleja? : "I am the president of Villarreal and they have not changed me, you have to change your attitude, not people, you could not wait a minute more, no other name". Philosophy and idea ? : "It will go well, I am an optimist and I do not think it is a mistake about Luis García and Calleja's exit, on day 15 it was an appropriate decision and at 21 it is another appropriate decision". Decision unpublished in First? (the Valencia, e93-94, did the same with Hiddink): "Just like the first time the unemployed did not pay the installment, separate directives in the box ... this president does many things for the first time. also go well ".